Ronald Carrera is one of SRMRC’s Band 6 Research Nurses, playing a key role in screening and recruiting patients for studies and clinical trials. He undertakes consent and randomisation of patients into trials, as well as collecting samples, preparing and administering trial drugs. He also has a role in monitoring patients for adverse events and completing case report forms. Along with his fellow research nurses, he attends trauma alert calls in the Emergency Department and provides assistance to ED staff if required. 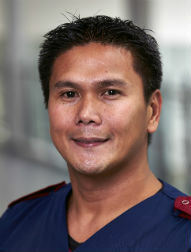 Ron worked as a telemetry nurse at St. Luke’s Medical Centre in Manila in the Philippines before moving to the UK in 2001 to work as critical care staff nurse at Sandwell and West Birmingham Hospitals in West Bromwich. After four years in that role he moved to the old Queen Elizabeth Hospital and worked as a cardiac critical care, where he was a staff nurse for seven years then as a charge nurse until joining SRMRC in 2013.